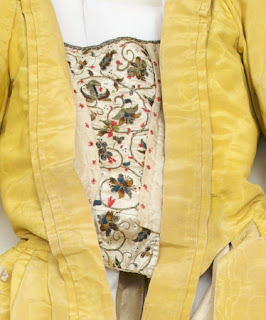 Last fall I started embroidering a stomacher, which is chronicled here. It's been an on again/off again project and last week I finally finished it! It's not perfect...I'm not crazy about all of my color choices...but it's done and I can (hopefully) wear it next season. I've been reading the 18th century novel Pamela, or, Virtue rewarded where I learned that embroidering was called "flowering." Three rows of chain stitches run up the center vine. My progress from February 2012 and today. That is BEAUTIFUL! My first attempt at "flowering" a pocket was so sad, but I hope to try again some day. I think your stomacher would look lovely with a yellow gown. Thank you, I'm glad that it's finally done! Did you use crewel thread for your pocket? I think the thickness of the wool helps make any errors look more authentic and it goes faster than using regular embroidery floss or silk embroidery thread. Oh yum that is so pretty! 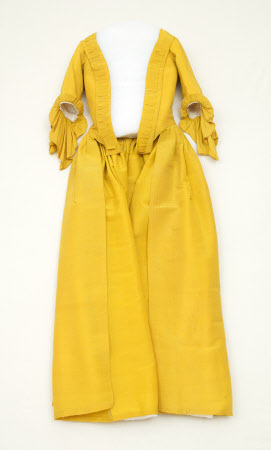 And a yellow linen gown would be fab with it! I like the color choices! One thing to keep in mind, is it so often would have been seen in the dusk of candle light, or indoors with just windows for illumination. Bold contrasts look so much better than subtlety in dim light. Thanks Alena! I think we're taking the same workshop this weekend...see you Saturday! You've done it delightfully! I too like the idea of the stomacher coming first and building the dress from there! It's such a focal point after all! Congratulations. Oops, I believe I commented on the wrong post. It came out beautifully! I love your color choices, and you've inspired me to want to embroider again! Yes...Nice work, but unfortunate color choices. Those are the colors that came in the kit. Constructive criticism is always welcome; derogatory comments are not.